This book (intended for beginning analysts, students, and the people training them) bridges general business problem solving and mathematics for improved effectiveness in work and life. Full of tools for solving real-world problems, this new edition is an ideal training manual for those who are intimidated by quantitative analysis and an excellent refresher for those looking to improve the quality of their data, the clarity of their graphics, and the cogency of their arguments. In addition to numerous updates—references, URLs, and reading lists—this third edition includes revised chapters and many new and updated examples. 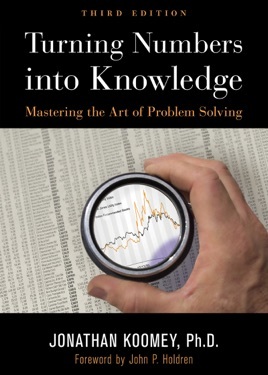 Mastering the art of problem solving takes more than proficiency with basic calculations; it requires understanding how people use information, recognizing the importance of ideology, learning the art of storytelling, and acknowledging the important distinction between facts and values. This beginner's guide addresses these and other essential skills.